I'm pretty excited to tell you about a meal in had last week in Binghamton. As a matter of fact, I'm fairly enthused just to have written that sentence, as it's not often I actually get excited about any food in Bingamton, but I feel like this town has really been aiming for the moon lately, and I'm happy to be here for the ride. The brand spanking new Social on State lures you in with an industrial/Art Deco sign outside, and while the interior is sleek, I think they were going for swank, and they kind of missed. The main bar is very modern and cool, but the animal print and red lighting veered a bit into garish for me. But as you'll quickly learn, good service and great food can more than make up for a hair too much cheetah. Grab a drink - we liked the antisocial and the basil slap, though I thought the chile presence in the simple syrup could have been stronger in both. Then hope that Eric is your waiter, because this earnest, attentive young man set plates down so gently on our table, we might not have known he was there, except his great concern over whether we were enjoying our meal and how the kitchen could improve was a positive signal, indeed. As we were dining on the kitchen's first official night with its full menu, the request for feedback was wise, and we were happy to oblige Eric. 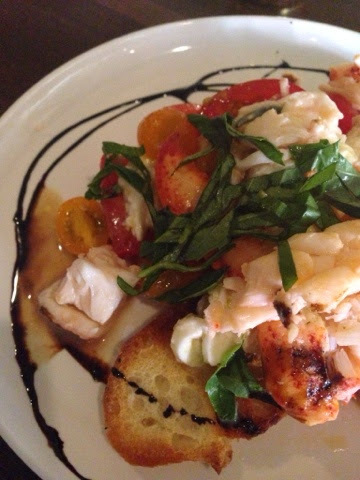 My favorite thing about the lobster caprese is that it exists on a menu in Bunghamton, NY. This splendid dish was herbaceous, bright and licoricey with tons of basil, graced with a generous portion of tender, creamy lobster and loads of tart grape and cherry tomatoes. We loved the combo of the seafood, fresh mozzarella, and tomatoes, but felt this dish could have used a finishing sprinkle of sea salt, and a little more cheese and bread. There was so much good lobster, but the bread was gone three bites in. A little balancing, and this dish will be famous in this town, I tell ya. 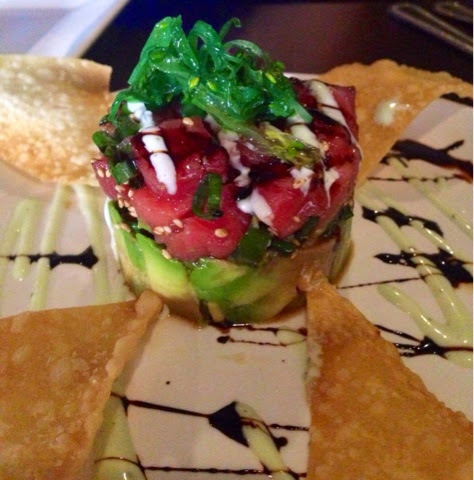 The ahi tuna tower was just about perfect. God, I love raw tuna, and I love that there are now so many spots to gobble it up 'round these parts! This one was diced and layered with avocado, accompanied with wasabi cream and soy drizzle, plus some wonton skin "chips." The wasabi balanced the fresh fish and creamy avocado with a bit of bite, and the soy with some much needed salt. But we did ask for more chips - again, there was so much good protein here, the "starch" provided wasn't ample enough to get through it all! 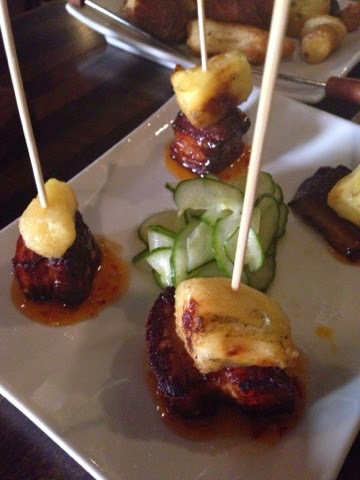 The pork belly and pineapple, predictably, was my favorite dish of the bunch. The sweet acidity of the fruit counterpointed the fatty, lush, meatiness of the pork, and I adored the very smart, clean-tasting addition of shaved, pickled cucumber. The spicy/sweet chili glaze was the first truly spicy thing to hit our table, and essential to offset the pineapple. There was good kick here, and it balanced this dish right on the edge - delicious. 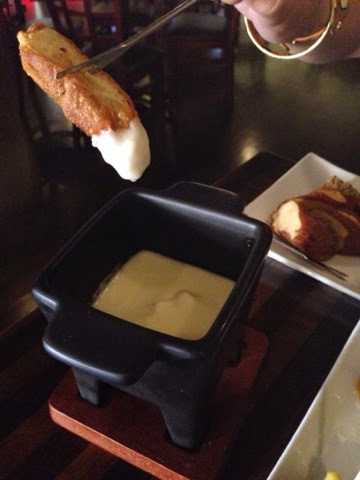 We ordered the fondue, and I found it a bit one dimensional compared to our first three dishes. The whole grain mustard served alongside perked it up, but was messy. I would recommend so e white wine, kirsch, and garlic added to this recipe, or even some hot sauce if they wanted to go non-traditional. The gazpacho was everything it should be: light, bright, complex, acid-forward without enough sweetness to balance. I liked the texture, too. Not chunky, but not a true purée, either. 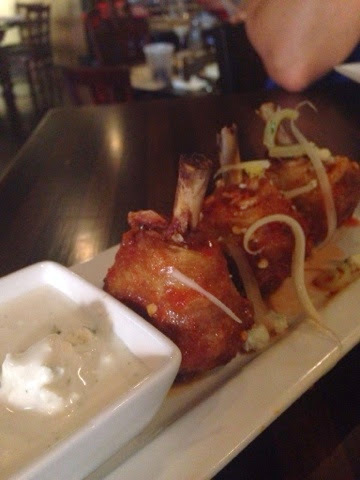 We ordered the chicken Osso bucco, which were really chicken legs prepared buffalo chicken style. The blue cheese dressing served alongside was well flavored and homemade, with cheese crumbled throughout. The chicken tasted more Frank's Hot Sauce doused than the listed sriracha, but still tasted good. But we thought they could have brought the spice more boldly. Also, the celery salad listed in the description was really just a few shavings of celery, which was confusing. Fried ice cream was dessert, and it was resplendent. There was Kahlua in the chocolate sauce, adding depth and complexity. Yes, the fried coconut coating could have been crunchier - perhaps some crushed corn flakes in the mix would have helped there - but it was delicious. We loved it. In fact, I loved our meal as a whole. 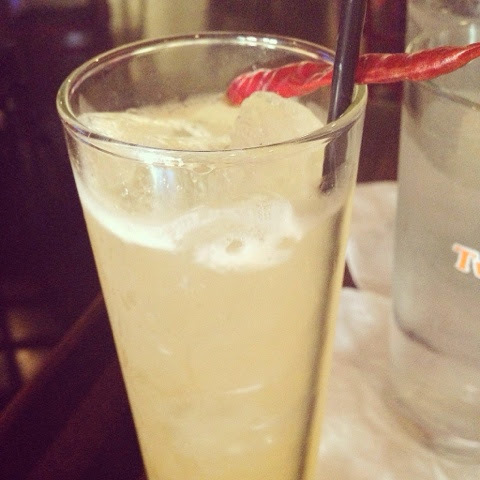 Good drinks, good service, inventive, creative food. Yes, there are items that needs tinkering, but we were there on night one - opening night! From this first taste, I would award SoS a seven on the BHS scale. Get on down there and give them more practice in that kitchen so this place can become even greater! My personality is big; my hunger is bigger! I love your small plates up front! The lobster caprese looks wonderful.